Footwear suited for microelectronic industries. Soft and comfortable anatomic perfumed PU footbed (the pattern ensures shock absorption and ease of movement). The antibacterial upper layer prevents bad odours, absorbs moisture, and keeps the foot dry. This boot is highly resistant to tear and abrasion. Conforms to: EN ISO 20345 S3 ESD SRC. Penetration resistance midsole up to 1100 Newton. SecurityLine GARONA complies with European protective footwear standards EN 20345:2011 and S1P HRO rating. Safety protection tested to 200 Joules impact toecap protection. Ergonomically designed and flexible, made using Nubuck /Mesh material. Up to 200C heat resistant outsole. PU Outsole and SRC - Slip Resistance Outsole provides protection and balance, stability and more durability. SecurityLine PUNTO complies with European protective footwear standards EN 20345:2011 and S1P HRO rating. Ergonomically designed and flexible, made using Full-grain Leather. Manufactured from 100% polyamide material. Designed with antibacterial and breathable fabric. Unique combination of materials guarantees superior comfort. Non metallic toe cap & midsole. Non metallic TOP RETURN Safety Toecap resistant to 200 J. Non metallic APT PLATE Midsole - Zero Perforation with low electrical resistance. Cofra Foxtrot S1 Shoe conforms EN ISO 20345:2011 S1 P ESD SRC safety standards. Cofra Kress offers ESD protection within the comfort of a black safety trainer. The footbed is made of scented polyurethane, making it anatomic, soft and comfortable. The form of the bottom guarantees impact energy absorption (shock absorber) and high grip. The upper absorbs moisture and keeps the foot dry. These shoes are best suited for microelectronic industries. Eye-catching safety trainer with electro static discharge properties, ideal for any ESD work environment. SANY-DRY lining is three-dimensional, breathable and antibacterial, it absorbs and releases the moisture, abrasion resistant. Aluminium toe cap protection tested to 200 joules impact and Non-metallic APT midsole plate tested to 1,100 Newton. Footbed: COFRA SOFT ESD, footbed made of scented polyurethane, holed, anatomic, with low electric resistance, soft and comfortable. Dual Density TPU/PU Sole: exceptional abrasion resistance with low electrical resistance. Cofra Kress S1P ESD Safety Shoe conforms to: EN ISO 20345 S1 P SRC ESD standards. Manufactured from 100% polyamide fabric. Lined with anitbacterial and breathable materials. Pattern implemented on the bottom layer provides impact resistant. Foot bed provides low electric resistance to the user. 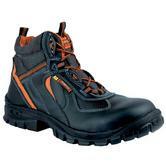 Cofra Hodur ESD Black Safety Shoe conforms to EN ISO 20345:2011 - ESD, S3, SRC safety standards. Designed to be lightweight and flexible allowing users to move fast and freely. 100% Metal free with a composite toe cap. This shoe is non magnetic and has no thermal conductivity. The comfort insole is removable. It has antistatic, moisture control features. Manufactured to optimise ventilation by using a distance mesh lining. These shoes are ESD (Electrostatic Discharge) protected. Ideal for working around machinery . Ideal for Electricians or those allergic to chrome made from synthetic materials. 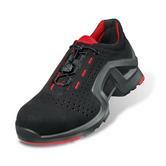 Shoe Trainer Black Red 8512.8 Uvex conforms to: EN ISO 20345:2011 S1 SRC safety footwear standards. Fulfils ESD requirements: resistance to ground 35 MΩ. Newly developed Puma Safety Condor ESD Safety Boot. Steel Toe-Cap protection with more space for the toes, for greater comfort. 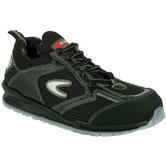 Penetration resistant, Flexible midsole made from ceramic-coated fibers, anti-static and energy absorbing heel. Fresh look Puma Safety boot from water-resistant oiled nubuck leather upper that offers protection against moisture penetration. SRC Slip resistance - protection against slipping on both ceramic and steel surfaces covered with water and cleaning products. Abrasion resistant PU outsole and bounce midsole offers an optimum of underfoot cushioning while reducing the weight significantly. Newly developed Puma Safety Pioneer Mid ESD Safety Boot. S3 Safety boot steel Toe-Cap protection with more space for the toes and greater comfort. ESD Puma Safety boot from Water-resistant leather upper and Abrasion resistant PU outsole. Bounce midsole offers an optimum of underfoot cushioning while reducing the weight significantly. Durable men jacket will last hard wearing and numerous washing cycles, an excellent choice for corporate uniforms. Castle Clothing 645/3 Men Work Jacket is an excellent choice for corporate uniforms. Two slant pockets with zip, Double left chest pocket with Velcro flap. Right chest pocket with zip and pen/tools compartments. Castle Clothing 645 Driver Style Polycotton Work Jacket fabric: 65% polyester 35% cotton 200 g/m². Caterpillar 15136 thermal long sleeve tee shirt is made from 100% cotton, long-sleeve t-shirt has the look of a layered t-shirt. The shirt is a black cotton tee. The dark grey heather sleeves are attached to the inside of the t-shirt sleeves to deliver warmth to your arms. The sleeves are made of a cotton-blend thermal material. The ribbed collar and sleeve cuffs are strengthened with spandex to give you long-wearing performance. Caterpillar C14991 Flex Layer Long sleeve T - Shirt is a comfortable and everyday product, made from a polyester fleece and cotton fabric. It comes with a textured spandex trim on the cuffs and bottom for shape retention and a better fit. The left breast has the iconic CAT logo, and the sweatshirt has a soft rounded neck. Comfortable design with neat hemmed sleeves. Self fabric collar & a taped neck for extended comfort. Placket consists of two rust free pop studs. Stylish design suitable for anytime wear. 3 piece hood with draw cord for a tight and secure fit around head and face. Front hand warmer pocket for those cold winter days. Rib trim with spandex will adjust around the wearer for a snug fit every time. Wenaas wool terry is developed as work underwear, with a focus on insulation against cold. The inside of wool terry transports moisture well and the garment's synthetic outside increases durability. Wenaas wool terry is a very comfortable garment that insulates well and dries on the body. The fabric is shrink resistant and the garments can be machine washed. In this category you can find a great variety of Electricians Workwear. We stock products from only the best manufacturers such as Amblers, Ansell, Caterpillar, Cofra, Honeywell, Polyco, Uvex, Wenaas and many more with our stock constantly growing. Is there a risk to electric ark flash? If so, be sure to buy electrical safety gloves AND and Arc flash coverall Wenaas Multinorm electrical arc flash overall. 1) Do I need ESD safety boots to dissipate a build up of electric static? (probably Yes) - so buy ESD safety footwear. We have 20 styles in stock, as well as ESD insoles. The safety shoes found here are chosen for electricians. They are lightweight, durable and protective. Most of the shoes in this category have ESD properties - which is something electricians may need on many occasions. Some safety trainers, like the Uvex 1 X-Tended 8511 and the Uvex 8512.8 ESD safety trainer are metal free, ESD certified and non conductive. a) Thicker, insulating safety gloves - to insulate electricians from electric arc flashes, such as the Honeywell Class 0 Electrosoft gloves or Polyco Class 00 Electricans gloves certified to EN 60903.
b) Slimmer, more dexterous, safety handly gloves - which are designed for handling small components during tasks. Gloves like the Ansell HyFlex® 11-120 have been manufactured with nitrile making them strong, durable, flexible and much more. 3) As an electrician, what are the most suitable work trousers? 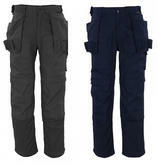 - Trousers with knee pads and external hanging pockets. Such as the Mascot Multipocket Cargo pants. or view our full range of knee pad trousers. 4) Working in dark or confined spaces, electricians need good lighting from head torches, flashlamps or flood lights. Where there is a risk of igniting dry dust or causing an explosion, then be sure to only use AtEx certified lighting. Our range of Electricians protective gear conforms to many different safety standards including EN ISO 20345 (safety footwear), EN374 (chemical protection), EN61340-5-1 ESD and EN60903 Protection Against High Voltages. 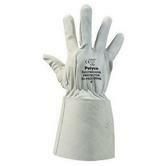 The Polyco RE3360 is one of our most highly protective electrical safety gloves. 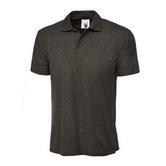 You can also find other Electrician clothing such as Polo shirts, Sweatshirts , Trousers and Hoodies. Not what your looking for? Then why not have a look through the rest of our products : Footwear, Gloves, Clothing.